Pictured in the Bank of Ireland Castlebar some of the local businesses who participated in the Bank of Ireland Enterprise week have been on hand in the branch during the week to give customers information on their products and services they provide, Alan Durcan, branch manager said ‘We have been running this event for a number of years, which is gaining in popularity, and once again it has been a great success for both the bank and the local businesses who took part’. 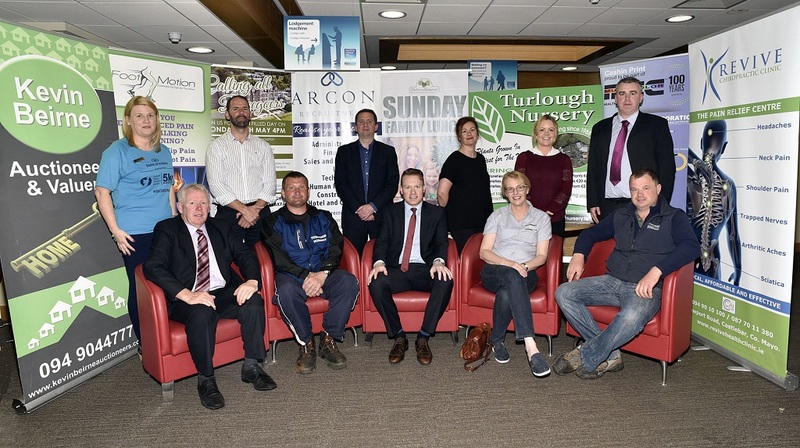 Front L-R; Kevin Beirne, Auctioneers, Marek Szopa, Turlough Nursery, Alan Durcan, branch manager, Laura Hill, O’Brien’s , Daragh Shaw, Turlough Nursery, back l-r; Sinead Shaw, bank of Ireland, Des Carey, Bosh Bar & Restaurant, Sylvester Jennings, Arcon Recruitment, Coleen McMahon, Café Rua, Dr. Lorraine Surdival, Revive Chiropractic Clinic, Michael Costello, Bank of Ireland Business Advisor. Photo © Ken Wright Photography 2016.